Allangrange Prints is a small family business started by Elizabeth and Allan Cameron in the late 70's to promote Elizabeth’s paintings. Their daughter, Kirstie Evans, joined the business in the early 80’s. 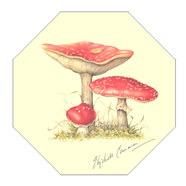 They started with five flower prints and gradually over the years, the stock of flower prints has been enlarged to include vegetable prints, fungi prints, fruit prints and the ever popular zodiac prints. Kirstie now runs the small business on her own from her home in Cornwall. 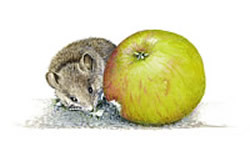 The prints are mostly limited editions, with the exception of the Helleborus Niger, Abutilon, Yellow Primrose, Summer Flowers and the zodiac prints, also the little Apple and Mouse print which Elizabeth painted for her granddaughter who is nicknamed ‘Mouse’. All the canvases have three coats of varnish on them; so can be wiped easily. They do not require frames and are perfect for the kitchen or dining room. We publish nearly all the vegetables on canvas as well as paper, except for the January King Cabbage and the Brussel Sprout, which are only available on paper. Also available on both canvas and paper are the Red Poppy, Nerine and Aquilegia and Agapantha. The Savoy Cabbage (the first vegetable we had printed), the Cauliflower and the smaller Sunflower which were all originally paper prints, are now only available on canvas – the paper editions have run out. The Zodiac prints were started in 1982 when Elizabeth painted a picture for her new grandchild of some of the flora and fauna that was out at the time. Her other grandchildren then demanded the same of their birth signs, and so she commenced painting all the zodiac signs with a bit of artistic licence as not all the plants were out in Scotland where she lived although they were perhaps out in Cornwall where her daughter and grandchildren lived! Table Mats - We have now sorted the quality of the tablemats, they are octagonal, made in the UK, and are melamine and will withstand temperatures of 140 and are very smart. The tablemats picture vegetables, fungi or fruit. You can choose which mats you want. 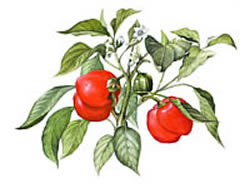 There are eight vegetable table mats to choose from, (six green veg, - asparagus, fennel, courgette and artichoke, cabbage and cauliflower and two red, a pepper and chili), six fungi tablemats to choose (four brown and two red) and six fruit, apple, pear, peach, quince, strawberry and raspberry. We also have matching coasters and at present we have two server mats, the cabbage and cauliflower. All are sold individually so that you can make up your own sets. 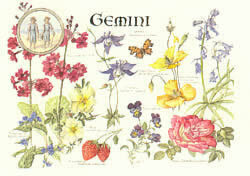 Acrylic Jigsaws depict the flowers of the zodiac months. These are copies of the bigger prints which depict some of the flora and fauna which are out in the month. They are made from acrylic and are small (A5 card size) but have 60-80 pieces, the edges follow the shape of the flowers so the only straight edge is along the bottom! and they have no corners. I think they look very special and would make great presents, perfect for most ages, though they are not suitable for children under about six or seven. The Book of Rhododendrons is a limited edition of only 500, it was printed in Italy by Stamperia Valdonega and with a forward by Peter Cox who is a well known rhododendrologist. 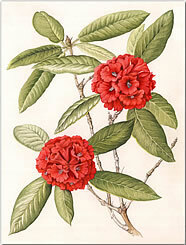 It is a book of 25 Rhododendron prints, all grown in Scotland except for one, R. Dalhousie which Elizabeth found in New Zealand. Sadly Elizabeth died in December 2008, painting up until two weeks before her death, four days before her death she announced that she would probably only live for another two or three years! although in January 2008 she stated that ‘this year I will die’ !! either way it was very peaceful and she is missed hugely, but she leaves a wonderful legacy of her paintings and prints scattered and appreciated all over the world. We cannot guarantee that the colours displayed on your screen are as vibrant as or the same shade as the actual print. The images are not to scale.